Relax and unwind! This light and spacious beachside house has 4 bedrooms and 2 bathrooms, polished floorboards throughout and a north facing deck off the living room. Nestled between the beach and the lake, listen to the waves and feel the sea-breeze. The downstairs rumpus room has TV/DVD and Foxtel. The large backyard has a BBQ, outdoor furniture and is fully fenced. Perfect for a game of backyard cricket and secure for children and dogs. Just a short walk to the friendly local shops, cafes and Pub. The Budgewoi house has everything you could ask for. Stocked so well for 8 people and beautifully presented with fresh flowers when arrived. Close to the beach and an easy walk to cafe and restaurant. Michael was really helpful and so easy to deal with. We will definitely be back. We had an awesome time.. beautiful beach home with everything you require..beds comfy beautifully renovated bathrooms and Michael was a fabulous host... thanks a million!! Glad you enjoyed your stay Sam. Hope to see you again soon. 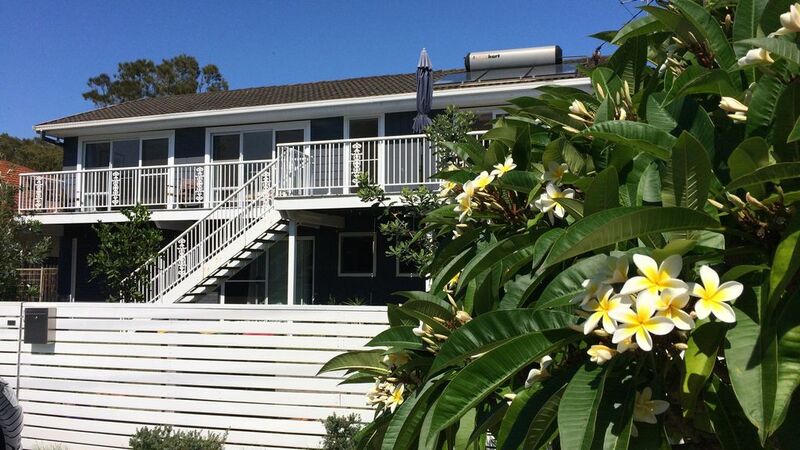 We had a fantastic stay at Budgewoi Blue Beach house. The house was perfect - a short walk to the beach and stocked with everything you could want for a beach break. The kids loved playing cricket in the back yard and our dog loved the walks on the dog friendly beach. The large tv was enjoyed by the boys to watch the summer cricket! Thanks Michael - we hope to be back! Great place. Great location. Very relaxing. Would highly recommend. Would definitely stay there again. Thanks Michael for a memorable holiday destination. Perfect family summer holiday house! Blue beach house was amazing! We had two families spend a week of summer bliss enjoying the seperate living areas, huge backyard and all the facilities available for us to use! The house was very clean and had everything we needed! Micheal hasn’t missed a thing when it comes to setting up the house for a holiday! We will all be back again to experience everything Blue beach has to offer! Budgewoi is a very friendly town with smiles at every corner and excellent shops and restaurants! Thanks for having us Blue Beach Budgewoi!!!!! !